→Jumping on Trampoline and Jogging – Which more? Jumping on Trampoline and Jogging – Which more? Let your body be active is very important to keep your healthy lifestyle. Thus, it is considerable to find out the most suitable and efficient mode of exercise that gives you fun and motivation to maintain for a long time. Trampoline is an ideal idea for you. Many people think that jumping on trampoline is better than jogging while there are some people loving jogging due to its convenience. However, based on your favorite recreations or ability and condition, jumping on trampoline or jogging is good for you. Why jumping on trampoline is more effective? It is undeniable that trampoline is more and more popular currently for many reasons. This kind of apparatuses is used to give jumpers lots of fun, efficiency of weigh-loss, balanced skill and coordination. In basic, rebounding 30 minutes a day can burn about up 210 calories to 230 calories. This training way is very useful for biochemical target with less demand of your heart, especially cardiovascular system. Jumping on trampoline is a good way for you to give strength training benefits. It is seen as activates lymphatic circulation. Thanks for that, your body will be cleaned from impurities and function of your immune system certainly be improved in an effective way. 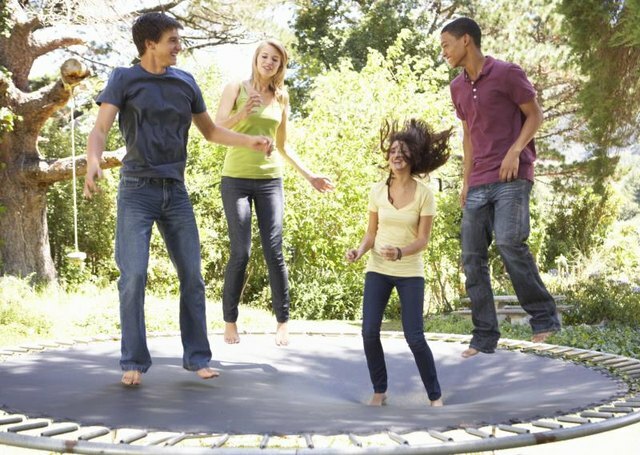 Rebounding on trampoline is a physical activity increasing your cardiovascular endurance as well as bone-density. Trampolining does not require any combinations of multiple exercises. When you have regular exercise, and do it with consistency, you will be stronger and easier to avoid risk of disease, elevated mood with more energy, nicer sleep now and ever. When it comes to enjoyable moments we achieve from trampolining. This is an outdoor or indoor recreation, ideal for both children and adults. Also, it is totally safe for people on it because of an addition of some tools like enclosure net, toolbar and more. In general, in comparison with jogging, rebounding on trampoline is better to impact to your bones and joints, which makes it more efficient than jogging. Regarding lower impact, rebounding on trampoline is lower than jogging, decreasing vulnerability of injures and protecting joints better. Why jogging is more effective? Trampolining is very good but jogging is also seen as a healthy activity that should be followed for a healthier lifestyle. They consider that jogging for 20 minutes can produce about 200 calories and even more. Like rebounding on trampoline, jogging results in the same heart rate levels and consumptions of oxygen. Besides, when doing jogging, it is not necessary to have an investment amount of training or equipments. This will make it cheaper and simpler to get your better cardiovascular endurance workout. You do jogging whenever you like, wherever you feel comfort. Jogging is a traditional activity, helping your body prevent from impurities and your immune system as well as increases your cardiovascular endurance and bone destiny. Just a pair of running shoes, you are able to do jogging. You are totally possible to jog on a trail, a track, a treadmill or right on the neighborhood byways. If you know how to have jogging on treadmill, it will more convenient for you to enjoy right at home with higher-intense workout. It will be more effective when you are in the weight-loss program. Also, in case you do not know or own a treadmill, don’t hesitate to process outside. The park, road are nice places for you to do, and it is nice weather, certainly. Doing jogging, you are not necessary to decide which combination of equipment and access gym clothes modifying your lifestyle as well as target of exercise. When doing jogging, you should mix it with other exercises in cross-training plan. This will be helpful for you to avoid over-use and swapped due to its low impact exercise like jumping on trampoline. Certainly, this case is usually seen in women. For men, injuries of knee are often from the high-impact activities of trampolining. As a research report of NASA, both jogging and jumping on trampoline are good exercise for astronauts. Through this training, you have chance to let your body into gravity, up and down, acceleration and deceleration. Moreover, these activities are an effective tool for you to increase heart rate, oxygen consumption with stronger muscle and serious bone endurance and more. They are a good foundation for an astronaut. In conclusion, both jogging and jumping on trampoline are good for your health, your lifestyle and daily activity. If possible, you are able to combine two activities. Save your body active is a right way to keep your longer life. If jumping on trampoline is enjoyable and stronger, jogging is interesting and makes your body improved. Thus, never be late if you could have any choice of two activities. You will have an awesome result. I have same opinion with you that jogging is more effective. Running and jogging help to improve your whole body structure while giving you metal benefit.